If you need a bit of fun and action during the holiday in Spain, you might want to visit one of the many great aqua parks, in total there are probably around 60-70 water parks on the map below we have collected more than 45 public accessible water parks. 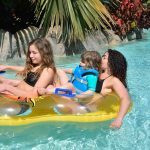 The water parks are located mainly on the Spanish east coast, but there are of course also some great parks on the popular Spanish islands like Mallorca and Tenerife. The top water park in Spain is the Siam Park, wait, actually it gets even better. According to tripadvisors 2015 worldwide water park awards, Siam park is the best aqua park in the world! Unfortunately most Spain visitor will not be able to visit the Siam Park as it is located on the Tenerife island, but if you are there you should for sure plan a visit to the park. Siam aqua park has a large Shark tank, some pretty amazing adrenalin slides with names like Kinnaree, Mekong Rapids, Dragon, Tower of Power, The Volcano and Singha. Of course the park also offers less rapid slides and lazy rivers, so there is something for adults and kids of all ages. Siam Park is located at the south-western end of the island near the city parts Costa Adeje, Playa de la Americas. The park has a free shuttle bus service to and from Los Cristianos, Las Américas and Costa Adeje. From other parts of the island there is a bus service (paid) which can be reserved here. If you arrive by car, there is a limited number of paid parking lots available close to the entrance. Just 1 km from Siam Park you can also visit the Aqualand Costa Adeja aqua park. One of the greatest aqua parks on the Spanish Mediterranean coast is undoubtedly the Port Aventura Aquatic Park which is located just next to its “sister park”, the Partaventure park, which is one of the best amusement parks in Spain. At Port Aventura Aquatic Park you will find adrenalin rides with names like Mambo Limbo, El Tifón, Ciclón Tropical just to mention a few. Of course the park also has less rapid slides suitable for kids as well as relax rides and rivers like the El Río Loco which is a 1500 meter long river ride. At the Bahama beach you can relax in a desk chair while the kids are enjoying in the shallow water. The park also operates several hotels so you can plan a few days for visiting both the water park and the amusement park as well as the soon to open Ferrari park. How to get to Port Aventura? By car: highway exits from E16 – AP-7 (Autopista del Mediterráneo) and Carr. A-7 (Autovía del Mediterráneo) are just a few km from the park, so getting there by car is really easy. From the highway there are sign directions Portaventura. By train: Port Aventura train station is located about 1 km from the entrance to the park. The station has fairly frequent regional and regional express to Barcelona and other towns. By bus: from Tarragona and the other nearby holiday towns there are local buses to the aqua park; from a bit further away there are daily buses from Valencia (travel time 5 hours), from Zaragoza there are a few daily buses (travel time 3 hours 30 min.) and of course there are also buses from Barcelona to Port Aventura which takes about 2 hours. The Aquarama water park is maybe not the largest aqua park, but according to visitors’ ratings it is indeed among the best water parks in Spain. Aquarama has some great long tube slides, the highlight being El “Salto del Diablo” (Devils Jump). Of course there is also lots of less challenging rides so that kids at any age can have fun at the park. For the smallest kids there is a great pirate area called “La Cala del Pirata”. How to get to Aquarama? By car: The E15 passed by just a few km from Aquarama, but the highway exits are a bit further away. If you are in the area, you can follow the country road N-340 which passes by the entrance of the park. Driving distance to Valencia is about 80 km and to the nearest larger city Castellón de la Plana there is about 15 km. By train: the nearest train station Adif Benicassim is located 1.8 km walking distance from the water park. The train station has frequent train direction Valencia and towards Barcelona. By bus: there is no bus stop directly at the park, so travelling by bus is not the best option. If you love adrenaline rides, Aqualandia is probably the water park of your choice. At Aqualandia you can find Verti go, the highest and fastest water slide in Europe (check video below). Of course Aqaulandia also has plenty of regular slides and lazy rivers (Amazon) for those who need less adrenaline. For the smaller kids there is an adventure land and a Laguna with plenty of options to have fun. On the park website here you can check out which attraction are available for kids based on their height. How to get to Aqualandia? By car: regardless of weather you arrive from northern or southern direction, just drive in direction Benidorm and once you have exited the highway drive towards centre and you will see sign directions Aqualandia. By train: getting to Aqualandia by train is basically not possible. The closest you can get is the tram stop Disco Benidorm which is about 2 km from the aqua park. If you arrive by train from larger cities in Spain, you should travel to Alicante and then take a tram or bus from there. By bus: getting to Aqualandia by bus from Benidorm is quite easy. Line number 1 and 11 drive from the centre every 20 minutes on weekdays and every 40 minutes in the weekend. From Alicante airport to Benidorm there are frequent buses all year around, also from Madrid to Benidorm there are several daily departures and the travel time is about 5 hours. The water park Aqauland in Torremolinos is one of the largest aqua parks in Spain and one of 13 water parks in Spain, Portugal and France operated under the name Aqualand. The park offers a wide range of Adrenalin rides like the Anaconda, Kamikaze or the Black hole. The large wave pool in the centre of the park is great for those who wish to try out surfing. For the kids there is a mushroom world and a children’s paradise. How to get to Aqualand Torremolinos? By car: the highway E-15 is passing just a few hundred metres from Aqualand. Regardless of whether you arrive from north or south, just exit the highway direction Torremolinos. By train: the Torremolinos train station is within walking distance of Aqualand. From the station there are frequent trains towards Fuengirola and Malaga. If you travel by train from any larger Spanish town, then travel to Malaga and change train there. By bus: there is a local bus line to the entrance of Aqualand. Buses from Malaga to Torremolinos as well as from other directions, stop at the centre of town which is about 1 km walking to Aqualand. The water park Aquabrava is one of the most beautiful parks in Spain. The whole park area is covered with palm trees and other green plants. For the adrenaline rush, the park offers rides like the Kamikaze, the black or the white hole. In terms of less scary rides, the park offers a large variety of tube based and rubber ring based rides which are also suitable for kids over 120 cm. For the smaller kids there is a Pirate and a Tropic island. In the centre of the aqua park there is a huge pool with waves. You can see all the parks rides here. How to get to Aquabrava? By car: The E-15 highway is about 25 km from Roses, exit the highway in direction Figueres / Roses and follow the signs from the exit towards Roses. By train: travelling by train to Roses it not possible. The nearest train station is located in Figueres, from there it is possible to continue by bus to Roses. By bus: from nearby towns like Figueres, Cadaqués, L’Escala, Llançà, l’Estartit and Castelló d’Empuries there are regional buses to Aquabrava. From other parts of Spain e.g. from Barcelona or Madrid you will probably have to travel via Girona. From France and Switzerland e.g Zurich you have holiday buses stopping in Figueres. Hope you found our small guide to the best water parks in Spain useful. On the map below you can find all aqua parks in Spain, just zoom in on the map or click on the menu to see information about a specific park. 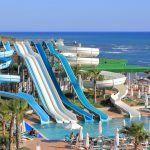 Also we recommend you check out our list of great water parks in Italy, maybe there you will find exactly the type of park you would like to visit.